The public lands surrounding Grand Canyon National Park contain high concentrations of uranium ore. To collect enough useable uranium to make operations profitable, mining companies must either pump harsh acids into the ground to dissolve the uranium for removal or extract and crush rock. They then leave most of the removed material in tailing piles that contribute to water and air pollution. Kanab North Uranium Mine, located next to Kanab Creek, a tributary to the Colorado River on the North Rim of Grand Canyon. Photo Robin Silver. Because uranium mining is not consistently profitable, these mining operations may be abandoned for many years — without any oversight or continued maintenance of the work area. Large drilling sites, tailing piles and mines are often left open to the forces of nature — leading to leaks into groundwater, dispersal of airborne uranium pollution and dust, and unsafe conditions for recreational visitors to public lands. And if and when these old mines are cleaned up, the cost burden usually falls on the American public. Even more disconcerting is the toxic legacy left on public lands and sacred American Indian sites. Iconic landscapes have been marred, and sources of drinking water remain polluted. Manmade ponds containing uranium-contaminated water are left uncovered and used by native birds and other wildlife. These mines affect habitat for more than 100 sensitive species, including mule deer, mountain lions, imperiled California condors and highly endangered native fish. Groundwater pollution has the potential to seep into underground aquifers used for drinking water and into seeps and springs that are the lifeblood for animals in the arid Grand Canyon region. 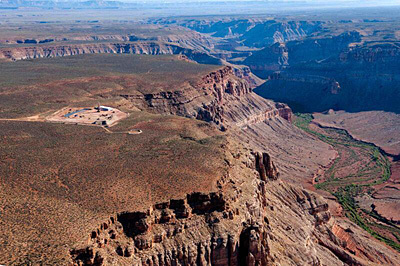 The Center for Biological Diversity opposes all uranium mining near Grand Canyon. Over the past decade, we have worked through the courts, through Congress, with the president and in the media to prevent new uranium mining and force the closure and cleanup of old uranium mining sites. To date we have been successful in securing and defending a ban on new uranium mining claims for 20 years on the doorstep to Grand Canyon National Park and have pushed back the reopening of old uranium mines through aggressive litigation. 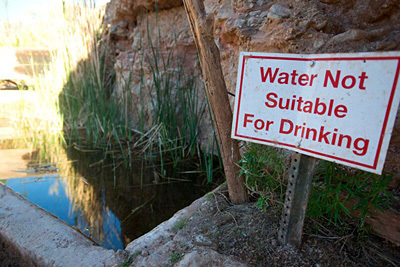 A spring near Grand Canyon contaminated by nearby uranium mining. Photo Kristen M. Caldon 2015, www.kmcaldon.com. We've submitted a legal petition to the Forest Service and Bureau of Land Management asking them to update old uranium-mining regulations that don't adequately protect public lands, tribal communities and human health. We're supporting a campaign to designate a monument that would permanently ban new uranium mining on 1.7 million acres of land that contain the sacred sites of many American Indian tribes, habitat for endemic and endangered species, and tributaries of the Colorado River. And we're fighting existing uranium mines, and the efforts of the mining industry to roll back existing protections, in federal court.